The country of origin of the persimmon is China. A persimmon not acid even all over the world is different though it is a fruit that represents Japan from of old as the fruit. Because the persimmon was an original mountain persimmon, a Saijo persimmon, and an astringent persimmon like [tamanbou], it makes to a dried persimmon to pull out bitter, and tannin is pulled out by the dry ice and heating. Because a dried persimmon can be stored, it becomes preserved food. 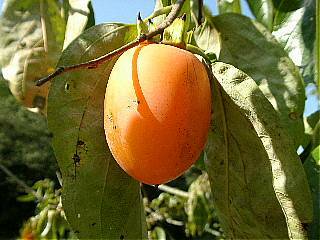 This photograph is a Saijo-persimmon of the astringent persimmon. It catches before it ripens, the skin is peeled off, and this is made a dried persimmon though it has already ripened. When the sweet persimmon such as Huyu-persimmon, Jiro-persimmon, and Hiratane-persimmons came to be grown with the improvement of breed, and autumn came, it came to obtain easily. I might eat as many as 10 pieces from several every day, and am contributing to my promotion of health. The medicinal effect that the persimmon is excellent as there was a proverb "When the persimmon reddened, the doctor becomes blue" was known from of old. I think that it becomes difficult to catch a cold if it eats the persimmon from the experience. Because vitamin C and vitamin A are very abundant, I think this to be a persimmon. Vitamin C and vitamin A enhance immune function, and the resistance power of the body is increased. Vitamin C is more than it was thought the persimmon. The content of vitamin C in the sweet persimmon 100g is called 70mg. It is said that it will equal a mandarin orange. It increases especially because the volume becomes small vitamin A of a dried persimmon compared with dried persimmon. A lot of carotenes and minerals are contained in another and the persimmon of tannin and potassium. There is working that improves the permeability of the capillary in the tannin contained in the persimmon. Moreover, there is a diuretic action in potassium, and is an effect of decreasing the blood pressure with tannin. Moreover, because the dietary fiber of pectin contained in the persimmon decreases cholesterol, it becomes prevention of arteriosclerosis and geriatric diseases. The carotene of the persimmon prevents arteriosclerosis. The carotene is concentrated and it becomes three times or more before it dries it when making it to a dried persimmon though it is acceptable only to eat the persimmon because the carotene of the persimmon prevents arteriosclerosis. Moreover, it seems to be good for health or more when making it to the dried persimmon dressing. It completes when putting it on the mixer mixing three dried persimmons, vinegars, the lemons, proper quantities, one the olive oil big spoon, the salt, the pepper, and water. The bitter element of the persimmon is included in all persimmons in tannin named [shibuooru]. There is bitter when it eats an astringent persimmon and an immature persimmon because tannin is a water solubility. This is because of tannin's hardening and not melting to water though there is black dots in the flesh of the sweet persimmon. It is said that it doesn't get sick from drinking when it eats the persimmon before sake is drunk. This is working of the tannin contained in the persimmon. The cause of getting sick from drinking with alcohol is acetaldehyde caused when alcohol is resolved. Tannin unites with acetaldehyde and it is exhausted to outside of the body. Working of the enzyme of catalase included in the persimmon also helps the resolution of alcohol and acetaldehyde. Moreover, the fructose (sugar) contained in the persimmon becomes the origin of the energy of the human body. Because the more unnecessary one is put out as urine by the diuretic action of the potassium contained in the persimmon voluminously, it is effective in the hangover. It is a method of sealing up by usually using carbon dioxide, alcohol, and the shochu and pulling out tannin. The persimmon is pulled out by using carbon dioxide, alcohol, and the shochu and tannin is pulled out by making it suffocated. A dried persimmon peels off the skin, exposes to the wind in a cold point, becomes in water by drying by tannin, and it becomes no solubleness. There is a method of saying as the heating escape tannin, too. I heated remaining the hot water of the bath a little in childhood, and the persimmon was put in the plastic bag in this, and it soaked and [keteoku] and tannin had come off at night. The smoking method is a method of pulling out tannin by fumigating it with various smokes like making the smoked food. Tannin seems to come off if both of the above-mentioned method persimmons are gradually bullied. Is it really so? The overeating of the persimmon has been noted. It is very delicious, and note the overeating even very much about the persimmon, please though it is possible to eat. It is said that the persimmon will cool the body. Moreover, it will occur many times in the rest room in the middle of the night when eating at night because there is a diuretic action. There is a lot of tannins in the persimmon and it doesn't become constipated by tannin, the absorption of iron is not disturbed, and eat too much, please if you have anemia. There are a lot of calories and it grows fat when a lot of eating because it contains a lot of sugar. Weight increases by the persimmon when I become the autumn of every year. However, a healthy effect is larger. It is a feature in the leaf of the persimmon that there are especially a lot of contents of vitamin C (10 times the mandarin orange) indeed of the persimmon though there are a lot of vitamins C. The leaf of the persimmon is made tea, and the tempura that uses the leaf with a young persimmon is the best to supplement vitamin C.